The “lounge” in Chaise Lounge’s name is no accident: This local sextet plays a cool blend of jazz and lounge that’s as easy to listen to as it is to recline in a comfy chair. On the group’s new album, “A Very Chaise Lounge Christmas,” the band tackles traditional holiday classics, lesser-known covers and a few original compositions. 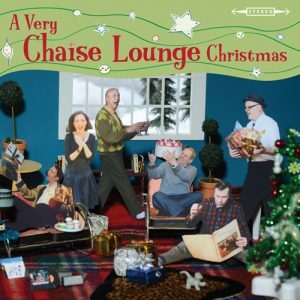 Surprisingly for a holiday album, though, Chaise Lounge’s original songs are the most memorable. Barnett’s piano melody beautifully complements Older on the ballad “The Heart of December,” while the whole group conveys a lively restraint on the horn-filled “December 25.” But the most charming composition is “Snow Day,” which channels the joy of the holiday season with a youthful innocence that’s usually impossible to capture outside of the genre of children’s music. Next review… is this getting redundant, again? Chaise Lounge are now contributors to the vast world of Christmas albums with A Very Chaise Lounge Christmas (Modern Songbook), and if you like your holiday festivities to be a bit on the jazzy side, this is for you. The songs on this range from the familiar to the slightly obscure along with new compositions, so you get to hear Marilyn Older grace her beautiful voice in tracks like “December 25″, “Good King Wenceslas”, “The Man With The Bag”, “Christmasville, U.S.A.”, and one of my all time favorites, “Little Drummer Boy”. It’s a chance for everyone in the group to shine in their own way, and even with the glut of Christmas music available, Chaise Lounge are capable of making these classics sound new again while exchanging them with new songs that will hopefully be recorded by others for years to come. CHAISE LOUNGE/A Very Chaise Lounge Christmas: Nothing beats a non gloomy Christmas down at the bar. Lounging it up on originals and classics together, this is not strict 90s lounge revival sounds as the crew goes deeper into genre blending on their newest platter. Easy rolling stuff that has lounge, pop, rockabilly, honky tonk and smatterings of other left of center sounds that show us what space age pop is like in the 10s. As much as we loved them last time out, we love them even more now as this is a quasi-retro juggernaut of cool in top form. It’s so groovy you can play it year round. The hype sheet calls it an instant classic and they aren’t kidding. Check it out.